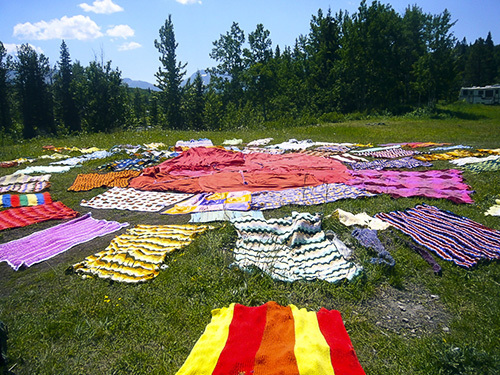 All summer long, local artists have been exploring dramatic, yet playful, visual concepts designed to focus attention on the logging and other resource issues in the Castle headwaters, southwest of Pincher Creek, Alberta. 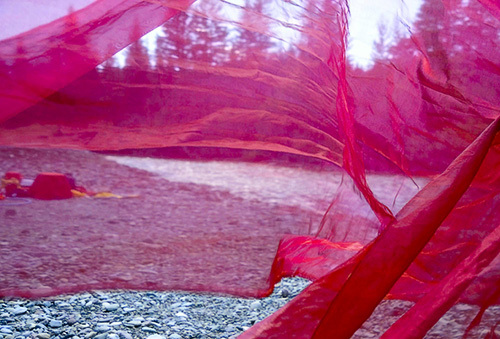 The concept, titled Red Alert for the Castle River Watershed, contrasts red and brightly-coloured forms with the natural landscape of the Castle River, and the Castle Special Place. 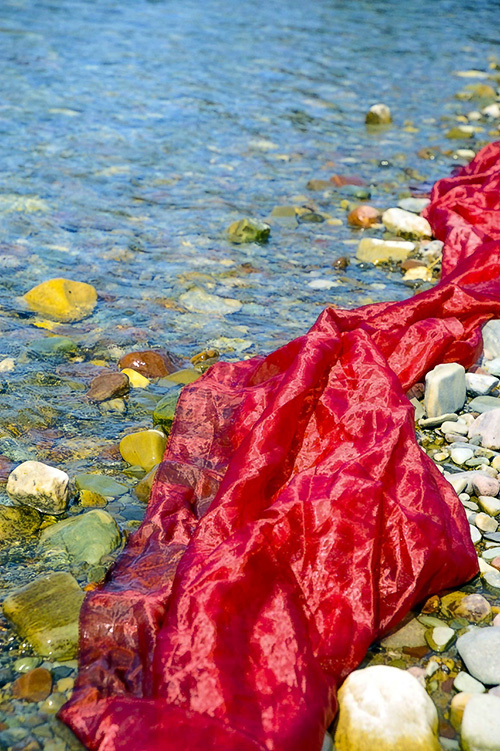 “The idea is to make a striking statement about the relationships between the human and natural worlds, and to draw attention to some of the issues that have put the Castle River Watershed on Red Alert”, explains Barbara Amos, a spokesperson for the artists. 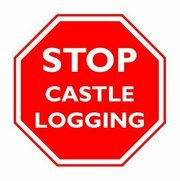 Of immediate and pressing concern is Spray Lake Sawmills’ clear-cut logging in the heart of the Castle Special Place. Designated a protected area, the Castle Special Place is considered core grizzly bear habitat and a vital “water tower” for the Oldman River Basin. Yet clear-cut logging began in February and is scheduled to continue over the next three years despite significant public opposition. The Red Alert artists invite everyone to come up with their own Red Alert images, to be uploaded to the Red Alert for the Castle River Watershed Facebook page http://www.facebook.com/CastleHeadwaters. Hundreds of people from more than 17 countries have now viewed the Red Alert Facebook page, and more artistic contributions are coming in all the time. The artists involved in Red Alert for the Castle River Watershed plan to continue to spread the word that the Castle headwaters are on Red Alert, while having some fun at the same time. Perception is the essence of making images. We all see the same physical world, yet we all perceive it through a personal filter. At what point do we depart from a literal recording of what we see? If we are going to create another view of something that has been done many times, how do we do it so that it adds a new idea to the conversation? If we are going to paint a landscape, do we understand the history behind previous landscape painting? Do we know the current debates? Can we add something that takes the conversation further and adds something new to the discourse? This is the edge that moves the creative endeavor into new territory and keeps it relevant to the next generation. It is not an issue of subject matter, or style, or materials. It is an issue of perception, that ability to absorb the milieu of the times, to be open, to perceive and, with that information, to create. My artwork begins with a place in the real world, and a perception of a moment that seems “loaded”. From this point, the path is frequently a detour and always the process, the journey, is the place of creation. The end result, the painting, the photograph, the event, or the sculpture, is a recording of that process. There are many places in our Canadian landscape that are worthy of thoughtful attention. The place that holds my attention is in Southern Alberta, along the eastern slopes of the Rocky Mountains, and specifically, the watersheds that begin the river systems that flow across Canada, through Alberta and Saskatchewan, and on to Hudson Bay. These watersheds unite all of us along their path. At the Crown of the Continent, from where I do most of my work, these waters are at their most pristine, and of spectacular clarity and beauty. All the people in the community that help me create these photographs are concerned about the threats to this watershed. We all work in various ways to communicate these concerns to the government. This is hard and tiring work, and we need an element of levity to sustain and restore us. We have fun making these images, and hope that they engage a new audience with these issues. I have set up a Facebook site so that participation is open to whoever might like to join us, in person, online, or in a sharing mode. Metaphors are the basis of this work. Look at these images and think about celebrating the river; bringing a party to the river with the river as the guest of honour; water as a sacred right belonging to all; water, which needs our guardianship; mandalas which are a made in the spirit of uniting the cosmos; bringing the participants together in a common unity; water as a source of joy on a beautiful day; and water without which there is no life. 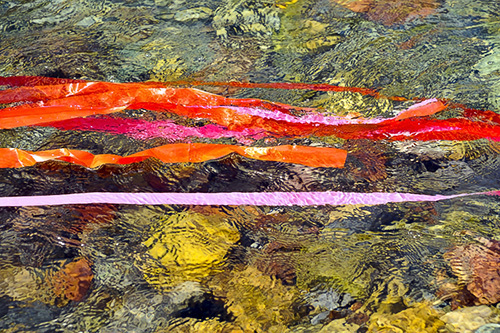 These photographs create metaphors about caring for our watersheds. They are part of the Canadian tradition of seeing the land as the focus for a work of art. This entry was posted on Tuesday, September 4th, 2012 at 11:06 am and is filed under Uncategorized. You can follow any responses to this entry through the RSS 2.0 feed. You can leave a response, or trackback from your own site. Thank you for continuing to bring the issues forward especially in this wonderful ‘non-confrontational’ way.